Well, this is not so much an example of a wacky power as just a case of Daredevil using his powers in wacky ways. You see, in Dardevil #2, our favorite hero finds himself in a bit of a predicament. Having been sent into space by Electro while unconscious, he has to figure out a way to land the rocket safely back on Earth. “There’s really no two ways about it: this story is a mess and a half. I wonder if it was a little more rushed than other issues of the period, because the plot seems built wholly on contrivances holier than the Pope–beginning with the rather baffling idea of sending the very blind Matt Murdock to do an assessment of the Baxter Building. Now the reader knows that Matt has special senses, but it’s baffling how neither Foggy or Karen seem to find assigning Matt the task odd (this may be the source of the many, many years of writers treating Foggy as a goof of the first order). There’s also the arbitrary use of Electro, in a role that could be filled by any one of (at that time) a dozen villains–in fact, probably should have, considering how the character was not portrayed as much of a big time schemer in his previous appearance. […] And there’s just the way Stan contorts logic, and Daredevil’s powers, in such a way that he’s not killed within the first half of the story. “Imagine a blind man operating a space ship!! Not as impossible as it seems if that man can hear the levers move, feel the power needed, sense the direction of flight!! This begs another question: Even aside from the fact that hearing levers move is pretty useless if you don’t know which lever indicates which function, do they teach space navigation in law school? Sure, Matt is supposedly a self-trained engineer (he was in the old days at least), but this has wacky written all over it. One thing I do find fascinating is the conflation of the word “sense,” in its biological and physical sense, with its more colloquial meaning. This is something that affects our understanding of the character of Daredevil to this day. In casual conversation, people use both “sense” and “feel” all the time to talk about things that they have come to understand or form an opinion about. When used this way, sensing something comes awfully close to simple having a hunch about something. And, hunches don’t necessarily need to be explained. However, if we actually mean to use the word sense, as in “becoming aware of something that is being relayed to us through one or more of our sense organs,” then the explanations given in Daredevil #2 end up explaining nothing at all. 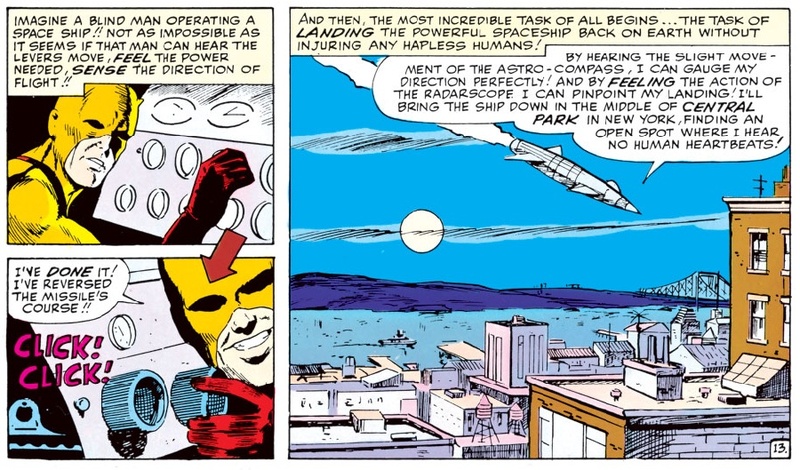 Thus, the colloquial usage of “sense” can be used to gloss over the fact that the relevant features of the craft’s navigation panel cannot be presented to Matt Murdock in a way that allows him to make adequate use of that information. Why, of course they teach space navigation in law school! And many other besides! That’s why Nelson and Murdock is a multi-discilinary firm. And isn’t it wonderful how Matt knows how to pilot a rocketship at all? Man, those courses in law school must have been more all-encompassing than you’d think. I have to say though, I did love Electro’s criminal enterprise in this issue. A series of daring bank robberies? Knocking over a string of top-end jewelers? Taking over the world? Nope. Hot car chop shop. Now **that’s** a lame super-villain. Actually, when Foggy, DD and the Black Widow were once taken captive by Hydra, the boys-in-green-and-yellow considered the last two so dangerous they chained them to a wall, and Foggy so pathetically harmless they didn’t even bind him at all. How did they escape, you ask? Foggy overpowered a guard, grabbed his fully automatic weapon, and, before anyone else could react, blasted the chains out from around DD and the Widow. While screaming at the top of his lungs. Fun and games ensued. I mean really….shot the chains right off them without even a scratch on their pretty bodies. DAMN impressive, I say. Even if we ignore his ability to run the rocket, which wasn’t built to to act like a plane much less be flown by a guy who can’t read the controls, his ability to hear over the rocket noise and air stream whether or not there is a heartbeat below on the ground is silly. Ha ha, well that’s another layer of absurdity to this situation.